Golfing is quickly becoming one of the most attractive sports around Europe, and Spain is no exception. New golf courses have been built and older ones renewed so that Spain now has some of the most cutting edge golf courses in the world. Vincci Hoteles offers the chance to combine the pleasures of golf with four and five star hotels perfectly located around Spain.Vincci has hotels in Seville, Malaga, Santander, Cadiz and Valladolid amongst others. From their offer we pick the top 5 hotels where you can improve your handicap. Whether in Marbella, Tenerife or Cadiz, Vincci has the perfect place to enjoy your vacation. At Vincci Selección Estrella del Mar you will feel at home at a stunning five-star hotel near the best beach in Marbella. Equipped with a pool, a spa, and its own beach club you will be able to relax, treat yourself and enjoy the fine cuisine of the shores of the Mediterranean. You will be able to do water sports, horseback riding, paddle and, of course, play golf at the best golf course in Marbella. In the Canarias island of Tenerife, you may choose between three Vincci hotels depending on weather you want to stay at the south of the island or closer to the hillside. At Vincci Tenerife Golf you are only 100 meters away from the golf course Golf del Sur. Golf del Sur is the only course with three competition rounds. It has been redesigned and broadened in 2005 with the Links field, in 2006 with the North field and in 2007 with the South Field. In the Links field we want to emphasize the attractiveness mixed with difficulty that the two lakes around holes three, four and five offer. Don’t miss out on that one. 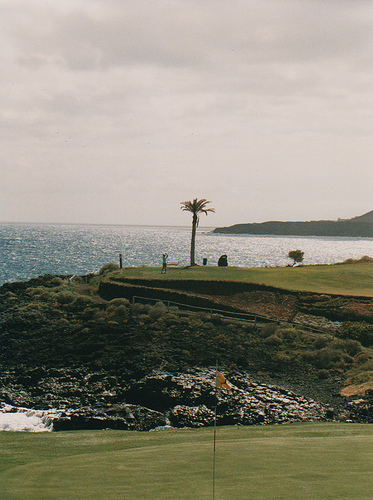 Close to Vincci Tenerife Golf there is also Vincci Selección la Plantación del Sur. A five star luxury hotel located at the famous Costa Adeje. La Plantación del Sur is a colonial hotel with tropical gardens on the picturesque Costa Adeje which offers the best views of the sea. Enjoy the spa, the delicious menus you can choose from in the different restaurants within the hotel, the tropical garden, and three different pools: one for children one for fitness and a heated pool. In the north of the island, at Buenavista del Norte, Vincci Selección Buenavista Golf & Spa 5* is waiting for you. In the middle of the Buenavista Golf Course and near the Teno mountain range Buenavista Golf & Spa combines a dream spa equipped with the best treatments and magnificent installations with the spectacular Buenavista Course. Designed by Severiano Ballesteros it is one of the most beautiful courses worldwide and offers spectacular views of the Teide and the ocean. Last but not least, Vincci Costa Golf 4* at Chiclana de la Frontera is the perfect combination of beach and golf in the most exclusive setting in Cadiz. Costa Golf offers two simming pools, four paddle tennis courts two bars and a cafe and a putting green where you can practice your swing and enjoy a couple of hits around the course. Enjoy your golfing experience in Spain at a great Hotel and at a great course. You will have a vacation to remember. Very informative and helpful tips. Thanks for sharing your experiences.